11 years old and going into middle school, you’d think I’d be feeling nervous or intimidated about starting school somewhere new. The truth is, every 2 years I’d attending a different school and this move was right on schedule. My two years in Honolulu were up, and the government decided that my next stop would be Altus, Oklahoma. Culture shock 101. Fast forward to high school. (who wants to relive all of that teenage/middle school angst anyway?) I’d fallen in love with this place I’d never thought I’d like. 5-6 years later I was still living life with the same people I entered middle school with. We saw other military kids come and go, but for once I wasn’t one of them. I’d never settled anywhere, but Altus was a place I was beginning to call my own. While I really liked where I lived, I still didn’t really fit in to any particular group. I was close to some of the kids in my youth group, but was friends with a few people in just about every social group. I definitely wasn’t a member of the “in” crowd. The more comfortable I was, the more meek I became; content in just being who I was and not having to try too hard to develop friendships before the opportunity wasted away. I was involved in a little bit of everything, so people knew of me, but I wasn’t known. I wasn’t born and raised in Altus, and was still considered just another military kid passing through. My senior year, a bunch of my friends and I decided we were going to do the local, hometown pageant. Miss Altus isn’t just any pageant though. It’s an event. People mark it on their calendar, they sit in the same spots every year. The venue is sold out before the show begins. The community rallies around the contestants and different businesses sponsor each girl so every single one walks away with scholarship money. It’s the best of the best as far as local MAO pageants go. By February, the whole community knows who the contestants are, and I was the weird girl that was painting for her talent. THAT should be interesting. While standing on the stage for crowning,I had zero expectations. I had had a wonderful time with my friends and that was all I’d really wanted. One last hoorah before we all went off to college. As they started to talk about Miss Congeniality, I knew exactly who it would be. A girl in my class was so sweet and never had a bad word to say about anyone. She had made a point to get to know everyone and I was sure she’d win. I was eyeing her to catch her reaction when they said my name. To this day my mom wishes she’d had it on video. Apparently you’d think I’d won a million dollars. I was SHOCKED! I took my award and went back to my place, beaming. I’d won something! And in my mind, it was the best thing I could possibly win. This had turned out better than I expected. Because I was a newbie and had no idea how the top 5 ballot worked, when another girl won an award I’d been eligible for and then placed, I checked out. I was so happy with my Miss Congeniality Award and I couldn’t wait to see my family. I was looking around, knowing who the winner would be, but trying to place the last few members of the top 5. As they called the first runner up I was trying to decide who it’d be and they said my name again. What? How does that work? In a zombie like state I went and took my place in the top 5. Shocked didn’t even describe it. And suddenly, things changed. People knew who I was when I went to WalMart or shopped on the square. People asked me how I learned to paint so fast and if I planned to compete again. Suddenly, I was a girl everyone knew, like I’d lived here my whole life. The feeling I’d had of Altus being my home was finally received by the others who lived here. There’s something about competing under the pressure of being the previous 1st runner-up. I competed a second time and ended up the 2nd runner-up. Looking back, I’m not sure I even deserved that. I was so high strung and was battling the opinions of many. I was lucky I made it through without having a heart attack. With that, I had no intentions of competing a 3rd time. I didn’t want to be “that girl” or continue making a fool of myself in front of this community that I loved. Maybe I would just never get to Miss Oklahoma. I’d been competing elsewhere and had won lots of scholarship money. I was 1st runner up here, and 2nd runner up there. Snagged a talent win and a few swimsuit wins along the way. That was good enough for me. Maybe I’d just keep competing elsewhere. Maybe Altus just wasn’t meant to be. Maybe they’d just never pick a girl that wasn’t born and raised here. Maybe, as much as I wanted to be, I’d never be accepted as a hometown girl. But the closer we got to the sign up deadline the more some of the fabulous ladies of the Miss Altus board begged and pleaded for me to come back. “Just one more time” they said. We won’t ask again. The only stipulation was that I had to paint something new. I’d been painting the same thing for the last 12 pageants I’d competed in. As daunting as figuring out a “new” talent seemed (while taking 21 hours at a college that was 1.5 hours away) I decided to take them up on it. One last time. Why not? The pageant for me was kind of a blur. I distinctly remember waiting to go into the interview room, and sweating like a beast. I remember walking in to a room full of mostly familiar faces and my shoulders relaxing. These people were to decide my fate, but I liked them. They made me feel at ease. The only question I remember in my interview was from the wonderful, late Bruce Bickford. He asked me why I wanted to be Miss Altus. 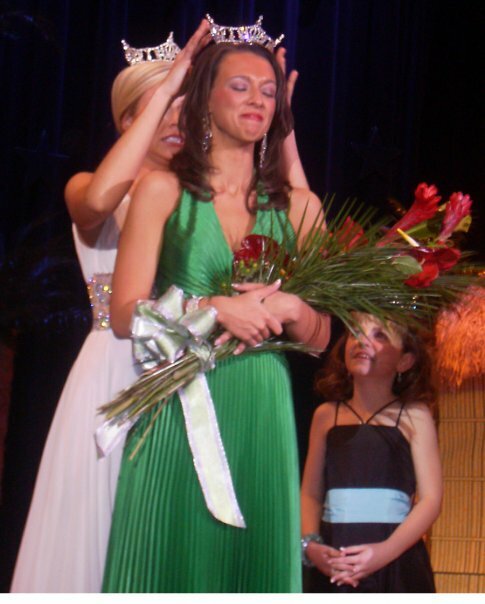 I’d thought a lot about why I wanted to be Miss Altus over the years. There was so much I wanted to say but just not enough time. I wanted to represent the town that had welcomed me and gave me a home. I wanted to give back to this community. I wanted to show people that Miss Altus was more than royalty, and that she wasn’t afraid to get her hands dirty in order to help someone else. I wanted to spread kindness. I wanted Miss Altus to be in the paper every week, like she used to be. I wanted for little girls to grow up in this town and always want to become Miss Altus. I didn’t want the title to ever become stale. I don’t know what I said exactly, but when I was done Bruce leaned back in his chair and said “I don’t know about you guys, but that’s all I needed to hear”. He set down his pen, crossed his arms, and flashed me that million dollar smile (Lord, how I miss that smile). He didn’t say a single thing after that. I just gaped at him for a second. Those judges let me sit in silence until it was almost uncomfortable and then they started asking more questions. I left not knowing what to think of what had just happened. I felt good, but it was the most bizarre interview I’d ever been through. It was either really good or really bad, and I wasn’t exactly sure which. I remember being surprised to laughter when the crowd roared during contestant introductions. I remember sweeping aside the bamboo curtains to walk out in my lime green swimsuit. I remember panicking when my white paint came out transparent on the canvas. I remember getting choked up as the US Air Force song blared while I painted my talent. My daddy wasn’t there to see me paint the eagle and the flag, but I was proud to be his daughter as I stood up there. I remember stumbling over my on-stage question and kicking myself when I got off of the stage. I remember sitting there waiting what seemed like forever for the crowning. I walked out with the rest of the contestants feeling like everything was in slow motion. They called me for swimsuit and I was a little shocked, but stepped forward to accept the award. They called my name for interview and I couldn’t have been more pleased. It was the first interview award I’d ever won and I would have felt a sense of accomplishment from that alone. Especially with how uncertain I’d felt when I left the interview room. Most people said at this point I should have known what was coming, but this is pageantry, and anything can happen. Earlier that year, a girl stood holding the same two awards but hadn’t walked away with the crown. I knew my talent was a love it or hate it kind of thing. It was hard to judge. I’d been told all year I probably just needed to sing or something. Maybe the judges hated it. There was no way to know. As they called the first runner up I thought “It still might not be me”, but when they said my name I stood there for what seemed like years as the tears welled up in my eyes. I didn’t know how much I’d wanted it until it was finally mine. I was the queen of my hometown, and I was going to make the most out of every single second. As it turns out, I’d won talent too. 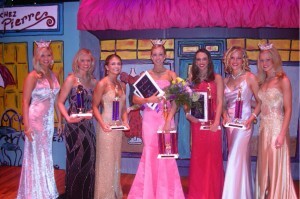 I was one of a handful of Miss Altus’s that has swept every single category. People still make fun of me for not knowing that I had won. It was the most stressful, difficult, and rewarding year of my young adult life. I won an amazing scholarship at Miss Oklahoma that I still treasure, and I wouldn’t change a thing. I was honored to be the 38th Miss Altus, and am still honored that they chose me. It’s not just about the crown. It was about giving back to a community that had given so much to me. That GIVES so much to me. Going home, I feel like I never left. I get to embrace old friends and catch up with people’s lives. People treat me like I’ve always been there. People welcome me home. As I enter into the land of pageantry, again, my heart aches that I will never again be an Altus queen, but I will always carry Altus with me. Because in the end, it isn’t at all about a title or even a spot on the map. Altus is a spirit. It’s community. It’s people. It’s a part of me that can never be undone. I’d like to give a sincere thank you to each of you who have given me a place to call home. Thank you for welcoming me into your tight knit family. Thank you for accepting me, for loving me, and for molding me into who I am today. All I can say is Wow!! This blog represents on the mark who you are and have always been. The fact that you feel this way despite some very challenging situations thrown your way, shows your character and your heart of gold. You are one of the most appreciative people I have ever met. You give back in life 100 times more than you get and still want to do more. Since you and your family came into my life, I have been enriched and blessed beyond belief. I love you and am so proud of you! You are a very special young woman who has enriched the lives that you have touched. Your parents did an amazing job raising you to be who you are now. I feel honored to have met you.